Immersion’s new album of seductive instrumentals takes in a wide range of moods and energies. Their music is a kind of Electro-Kosmishe - the sound of the 21st century, which nonetheless draws inspiration from German pioneers such as Cluster and Popol Vuh. And, like those groups, Immersion can create a world which is simultaneously devotional and sensual. Cut to a mere 17 years later, and a new Immersion album glides into earshot. Their sound is unmistakable. And yet, clearly the duo have evolved. Immersion has returned a different beast. The pulsing and sliding analogue synths are still present and correct. Indeed, the stately and plaintive Mechanical Creatures , with its constantly evolving web of analogue synth throbs, could easily find a home on Fripp and Eno’s classic Evening Star album. But there are also several sonic advancements from Immersion’s previous recordings. The most noticeable differences are the introduction of guitars into the mix and an increased sense of urgency to their compositions. This means, Analogue Creatures Living On An Island cannot be classified as ambient music. Although it does have its contemplative moments - such as the gently unfolding Slow Light - the majority of the album is powered by a strong sense of motion. Nanocluster is a tense and insistent composition. Coming over like the score to some futuristic spy film, it demonstrates Immersion’s skill at creating miniature sound worlds alive with detail. Meanwhile, the urgent forward propulsion of Organic Cities weaves in shades of prime era Tangerine Dream - and may well be the album’s highlight. The fact the album has been largely constructed using analogue instrumentation rather than digital, definitely gives it a warmth and depth which sets it apart. And it’s true the album exhibits a very organic flow. Another contributory factor could well be the duo’s relocation from London to Brighton. “We live 10 minutes away from the sea,” says Spigel. “We walk by it almost every day. It’s different every time we see it, even every hour. We’ve definitely been inspired by the light and the sound.” This influence is perhaps heard most strongly on Spinner, the sonic equivalent of a bright spray of light radiating across a seascape. 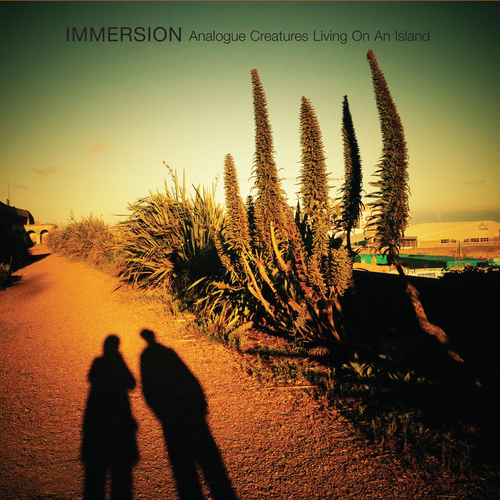 Analogue Creatures Living On An Island is the point where Immersion emerge from being one of the UK electronica scene’s best kept secrets, and gain the recognition they so richly deserve. For those who prefer vinyl, the album is available spread across two 10” singles Analogue Creatures and Living On An Island respectively. Unfortunately at this time we can't offer all the Immersion - Analogue Creatures Living On An Island tracks as individual flacs, as some of these tracks exceed the shops maximum (9mins) download length.